Last Christmas I was lucky enough to receive not 1, not 2, but 3 packets of angel food vegan marshmallow mix from my lovely nan and vegan Emma. It's taken me over a month to get around to making them, mainly because I couldn't find/John Lewis were sold out of candy thermometers. 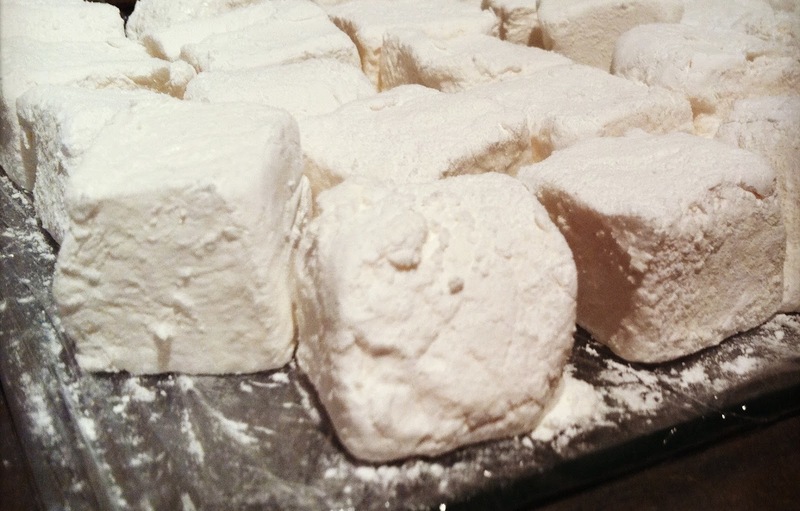 I finally got one last week, so put it to good use and made my first ever vegan marshmallows. I'm not going to lie, the first time I read the instructions for the mixture it made my head hurt a bit. It seemed very confusing, but when I actually did it, it was pretty simple. It just felt a bit more like I was doing a science experiment rather than baking. First of all you whisk packet A with some water which makes a big fluffy mixture, almost like egg whites. Then you mix B with some more water which made brown water (ew). Then you have to make a sugar syrup (hence why I needed a candy thermometer), which you mix the brown water in to. Lastly you pour the syrup in to the fluffy white mixture, which melts it! I don't know if this is quite right as it felt like all of my good mixing had just been destroyed. Then you whisk for what seems like an eternity until it becomes white and fluffy again. So, yeah, very simple! Mine turned out slightly (that's an understatement) squishy, in fact you can't really pick them up, but I don't know whether this is down to over mixing, under mixing or just getting it a bit wrong. The instructions are a bit vague on how much to mix, so the only way to find out is to make them again. I spied some strawberry icing sugar in Morrisons so I'm going to make pink ones next! I definitely recommend trying these if you're a vegan/vegetarian sweetie fan. Lot's of marshmallowy fun to be had! UPDATE: So I feel I may have definitely made them wrong, they just got more and more squishy until they imploded in to a weird pile of goo!